Anna Maria Island – Seven-mile long Anna Maria Island lies just south of Tampa Bay bordered by Sarasota Bay, Anna Maria Bay, and the Gulf of Mexico. It is a quaint little island with “Old Florida” atmosphere. Bradenton Beach – North of Sarasota, this 27 miles of white sandy beaches include Anna Maria, Holmes Beach and Bradenton Beach. Bird Key – A small island that is an exclusive gated community located between the mainland and Lido Key. Many notable celebrities reside in this unique waterfront community of luxurious homes. Casey Key – An exclusive eight mile tropical island that is uncrowded, quiet and offers tranquility and unspoiled beauty. Lido Key – European-style island bordered by four bodies of water, the Gulf of Mexico, Big Pass, Sarasota Bay, and Brushy Bayou. North Lido beach is a pristine half-mile stretch of sand and very private. South Lido beach is 100 acres of Australian pines, picnic tables, grills, a volleyball court, playground, wooden walkways, trails and canoeing opportunities. Longboat Key – An eleven-mile private island paradise located between the Gulf of Mexico and Sarasota Bay with a luxurious lifestyle that is unsurpassed. Siesta Key – Siesta Beach is recognized as having the “whitest and finest sand in the world.” Sarasota’s Siesta Key Public Beach extends along a half-mile of the most pristine white sands in the world. The pure quartz, pulverized to a fine powder, has a magical quality. There is no sand quite like Siestas, anywhere. Even under the burning subtropical sun, it feels cool to the touch. Venice Beach – Fourteen miles of white sand beaches located south of Sarasota, Venice Beach is known as the shark’s tooth capital of the world. One beautiful photo taken at Sarasota Beach weddings is having the sunset behind the couple. To do this, you have to know how to turn on your camera’s flash so it lights the couple. Otherwise, you will have a beautiful silhouette of the couple with a stunning sunset behind them. 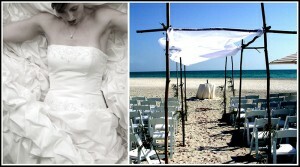 Both, my favorite way to photograph the couple on the beach!